• You should raise and lower your awning carefully. Also don’t tug on the mechanism or over-wind the controls. • You should retract your awning when not in use. Consequently you will minimise the possibility of damage due to vandalism or adverse weather conditions. • Never leave your awning out in windy weather conditions or when bad weather is expected. • Don’t allow dirt to accumulate on top of your awning. Gently brush off loose objects eg) leaves and twigs before attempting to retract the awning. • Hose your awning down from time to time but also allow the fabric to dry thoroughly before retracting it. • If you want to clean your awning, use a mild soap (not a detergent) and immediately rinse away every trace of residue. You should never use a harsh cleaning fluid or an abrasive. We can recommend specialist awning cleaning companies for a professional clean. • Note that on straight, flat awnings, make sure the cover always rolls over the roller. • Avoid hanging anything on the framework. Can you refurbish an Awning? • When you feel it’s time to refurbish or repair your awning please contact us. Recovering an awning may be less expensive than carrying out extensive repairs. 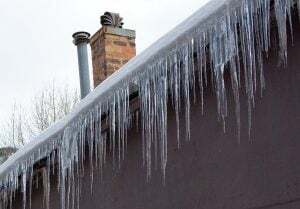 • If it rains and the weather forecast is very cold, you should retract the awning before any ice can form. Additionally, when it stops raining and there is no longer any frost, open the awning and let it dry before retracting it. • Do not allow snow or ice to accumulate on the awning. • If the mechanism has frozen, do not operate until it until it has thawed. • If it rains and the weather forecast is very cold, you should retract the awning before any ice can form. When it stops raining and there is no longer any frost, open the awning and let it dry before retracting it.